Ephesians 6:10-11: Be strong in the Lord and in his mighty power. 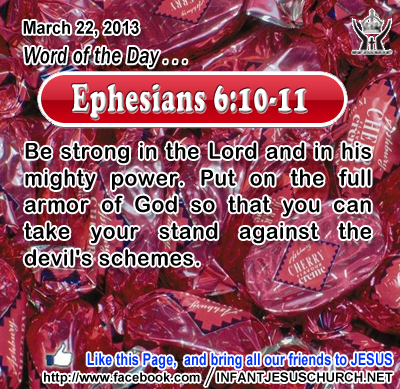 Put on the full armor of God so that you can take your stand against the devil's schemes. Heavenly Father, Strengthen us, that we may stand against our foe and triumph by the power of your Spirit so that we may bring honor and glory to our conquering Savior who will return one day and take our home in victory. In the name Infant Jesus we pray. 31The Jews took up stones again to stone him. 32Jesus answered them, "I have shown you many good works from the Father; for which of these do you stone me?" 33The Jews answered him, "It is not for a good work that we stone you but for blasphemy; because you, being a man, make yourself God." 34Jesus answered them, "Is it not written in your law, `I said, you are Gods'? 35If he called them Gods to whom the word of God came (and scripture cannot be broken), 36do you say of him whom the Father consecrated and sent into the world, `You are blaspheming,' because I said, `I am the Son of God'? 37If I am not doing the works of my Father, then do not believe me; 38but if I do them, even though you do not believe me, believe the works, that you may know and understand that the Father is in me and I am in the Father." 39Again they tried to arrest him, but he escaped from their hands. 40He went away again across the Jordan to the place where John at first baptized, and there he remained. 41And many came to him; and they said, "John did no sign, but everything that John said about this man was true." 42And many believed in him there. They charged Jesus with blasphemy because he claimed to be the Son of God. Jesus made two claims in his response: He was sanctified by the Father to a special task and he was sent into the world to carry out his Father's mission. Jesus confronted his opponents to accept his works if they could not accept his words. One can argue with words, but deeds are beside argument. Jesus is the perfect teacher in that he does not stand his claims on what he says but on what he does. The word of God is life and power to those who believe. Jesus shows us the way to walk the path of truth and sanctity. And he anoints us with his power to live the gospel with joy and to be his witnesses in the world. Are we a doer of God's word, or a forgetful hearer only? Write upon our heart, O Lord, the lessons of your holy word, and grant that we may be a doer of your word, and not a absentminded hearer only.